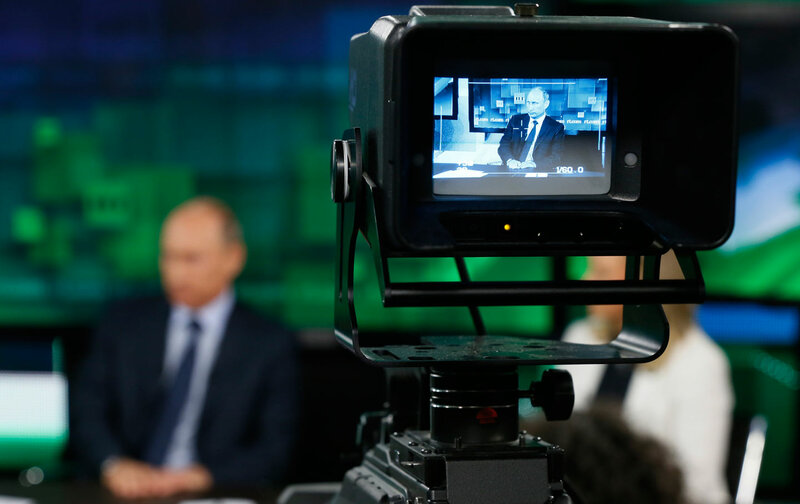 Who’s Afraid of ‘Russia Today’? Hand-wringing over Kremlin propaganda says more about about US media’s insecurity than it does Putin’s reach. Donald Trump’s taboo friendly posture to Russia has pundits in a frenzy. Every day we have takes in major media outlets insisting Trump is a de facto Kremlin agent, a pro-Clinton Super PAC has launched a Web site to “raise awareness” of “the dangerous Putin-Trump connection” that even comes complete with a hammer and sickle (despite the fact that both Putin and Trump are ardent capitalists), and MSNBC’s Joy Ann Reid had on a guest who suggested Putin would invade Ukraine to steer the election Trump’s way. One subgenre of this frenzy is a renewed focus on Russian-funded English language cable network Russia Today, which critics have accused of going to bat for Trump and working to undermine Clinton. The latest example of this sub-take is Jim Rutenberg, media columnist for The New York Times. In “Larry King, the Russian Media and a Partisan Landscape,” Rutenberg muses on the rise of relativism and the loss of objective truth in media. This is a typical frame when discussing the uniquely sinister nature of RT, and it’s one worth dissecting in detail. Rutenberg begins by citing RT’s lockstep support for the Russian invasion of Crimea as evidence it’s not a real news source. However, it’s worth noting, The New York Times‘s editorial board has supported every single US war—Persian Gulf, Bosnia, Kosovo, Iraq, Libya—for the past 30 years. While its reporting and op-eds on these wars has often been critical, much of it’s coverage has also helped to sell war-weary liberals on the current military mission—the most notable example being Judith Miller and Michael Gordon’s hyping Iraq’s nonexistent nuclear program in the buildup to the March 2003 invasion. Indeed, the image of The New York Times as an objective, unbiased news outlet is precisely how it was able to sell the war in the first place. The difference is one of efficacy, not affect. This isn’t to draw an equivalence; indeed, The New York Times and RT are apples and oranges in many ways. It’s essential in proper liberal circles to “other” RT, to remind people how it’s not real news and that, while American media have problems, they’re on a different moral plane. This tic mostly serves the function of signaling one’s “seriousness” and ingratiating oneself to the prevailing orthodoxy. (It certainly can’t provide any new insight, since this is already the conventional wisdom.) And while there are many good arguments to this effect, it’s a tedious form of ideology auditing and not one I wish to indulge for the purposes of this piece. The more important question is not whether RT is “propaganda”; it’s whether the nonstop insisting that it is—in some unique and pernicious way—serves any useful function beyond careerist signaling and anti-Russian point scoring. The odds are, the average American is far more likely to hear about how terrible RT is than actually watch RT. From The New York Times to Time to BuzzFeed to The Daily Beast to Politico to The Washington Post, virtually every major American news outlet has dedicated considerable time to column inches to reminding us how sinister the Russian-funded network is. The question is, who cares? Russia Today’s reach is relatively minor. What, one may ask, are we so scared of? More speech, as the adage goes, is always better than less speech. Soviet propaganda added urgency to the United States’ taking the civil-rights movement seriously. Japanese propaganda was, according to Douglas Blackmon in his book Slavery by Another Name, one of the primary reasons Franklin Roosevelt sought to end debt peonage for African-Americans in the South. Getting trolled, for lack of a better term, by counties hostile to your interest can have healthy consequences. Just the same, while Russia Today toes the Kremlin’s line on foreign policy, it also provides an outlet to marginalized issues and voices stateside. RT, for example, has covered the recent prison strikes—the largest in American history—twice. So far CNN, MSNBC, NPR, and Rutenberg’s employer, The New York Times, haven’t covered them at all. RT aggressively covered Occupy Wall Street early on while the rest of corporate US media were marginalizing from afar (for this effort RT was nominated for an Emmy). Perhaps Rutenberg and those Deeply Concerned about RT can see why there may be a market for RT to fill here. In many ways, RT’s success, to the extent it has had any, is as much an indictment of American corporate media as it is an expression of sinister Kremlin disinformation. Rutenberg, as many others have, insists RT is uniquely evil because “journalists who stray can wind up beaten or dead.” But even this critique is rather selective. Qatar, Al Jazeera’s patron, is a monarchy that stifles dissent while arming extremists in Syria and Libya. So does Al Arabiya’s patron, Saudi Arabia, which also executes LGBT people for the crime of being LGBT. The BBC’s patron, the British government, helped launch a war of aggression against Iraq that killed over 500,000 people. In April 2003, the United States bombed an Al Jazeera office in Baghdad, killing reporter Tarek Ayoub under suspicious circumstances. If news organizations are judged by the sins of their government patrons, we wouldn’t have government funded media. Also missing from the posturing over RT is a bit of perspective. For decades the United States has supported similar tactics overseas to push their agenda—from the Voice of America and its assortment of spin offs to “pro-democracy” initiatives that often, with the help of Western NGO and think tanks, funnel money horizontally by sponsoring pundits who write in foreign media outlets. The professional hand-wringing classes make a distinction: that US-backed media are truthful and held to higher standards. While this is true in a strict sense, often times this simply means the United States is better at information war, not that it does less of it. The CIA helped produce, without disclosure, Argo and Zero Dark Thirty, two glowing CIA commercials. The US government, via USAID, secretly created a fake social-media platform and infiltrated the hip-hop scene in Cuba to “stir unrest” and undermine the government. The Department of Defense runs a $100 million program to manipulate social media overseas, complete with fake sock-puppet profiles in “Arabic, Farsi, Urdu and Pashto.” How many Americans are aware of these practices? Probably a lot fewer than know about Putin’s evil cable network. The fundamental question is: Why do powerful media outlets feel the need to rush in and play ideological hall monitor and decry such a relatively minor player in American news? If a fraction of this energy went into critically examining our own country’s propaganda techniques and giving voice to the marginalized topics and people, perhaps the market—to the extent there is one—for a “counternarrative” would dry up and render outlets like RT irrelevant. Editor’s note: An earlier version of this piece stated that RT reaches fewer than 30,000 Americans a day. RT disputes these figures, which come from a Daily Beast report, and the audience figure they provide has been added to the article.